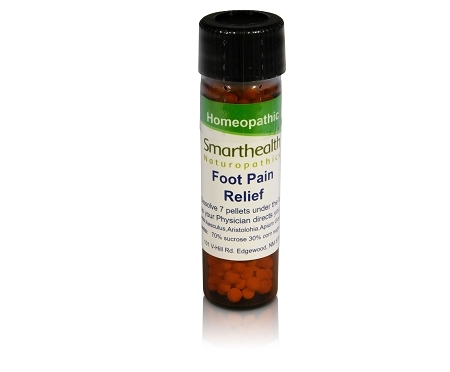 Foot Pain Relief Medicine | Oral Naturopathic/Homeopathic Medication Buy Naturopathic Medication From Our Online Store. For long term relief of foot & sole pain. For long term foot pain relief, plantar facia, and painful soles. From standing on hard surface's too long or being on your feet too long! All natural homeopathic medicine for feet (not ankles. )Works great for men & women and all people. 3 month unconditional guarantee. Directions: dissolve 7 pellets under the tongue once daily until the vial is complete or as your Naturopathic Physician directs you.made in the U.S.A and manufactured in an FDA supervised laboratory using state of the art manufacturing methods. Active ingredients: Aesculus Hip, Aristolochia, Apium Gravelens, Berberis Vul, Stillingia. Inactive ingredients: 70% Sucrose. 30% Corn sugar. Non-allergenic pellets. I still can't get over how you can take these small pellets and your foot pain go's away! It took about 2 weeks for the pain to go away, it's about 95% gone. The ad said that you should take a mineral to, strontium, I just ordered today. I can't wait to see if that works too. Seemed to make the foot pain I've had for 2 years now go away!